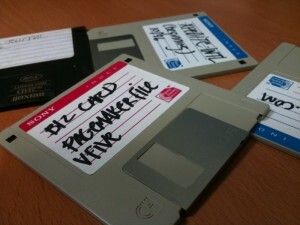 These are my last four floppy disks. On them are two of the very first web projects I did with Rob back in 1996 including a copy of our first logo (in PageMaker no less). I also pulled out two dozen journal entries from when I started college in 1994. I’m sure they will make for some hilarious reading this week. As I say goodbye to these disks though, I want to note how incredible it is that they worked at all. I plopped down a circa-1998 VA Linux Server onto our spare desk, powered it up and read all four disks without a single issue. How much media do you have today that you could open up in 15 years and still read successfully? I have a hard time reading a CD-R 10 minutes after I burn it! Mad props to you, oh Floppy Disk, for your years of stable storage!